The concept of noise reduction via the LP-like approach is referred to in . The original idea of using speech modeling for speech enhancement was based on grouping approximately 40 phonemes in the English language into five classes, such as stops, fricatives, glides, vowels and nasals. (These classes could be considered as a loose precursor or a distant variant of a codebook used in the low-bit-rate codecs such as CELP). Each phoneme is processed by a separate filter designed specifically for the given class. The main purpose of filtering by the separate filters is to remove any intra-class mischaracterization. The operation of the method illustrated in Figure 1 is as follows. The input signal (speech and noise) is parsed into phonemes. The decision block makes the determination of which class the given phoneme belongs to and then routes the respective segment with speech and noise to the appropriate filter. The filters allow the speech segments belonging to the respective filters to go through while the noise components are filtered out in this process. 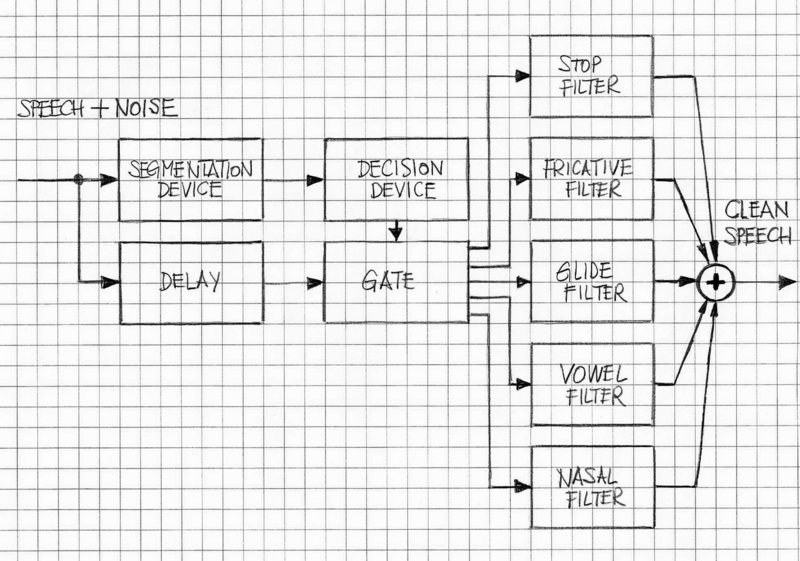 The filter outputs are combined and the clean speech is routed through the remaining part of the Speech Enhancements System. More information about speech-model-based approaches to Speech Enhancement is provided in . VOCAL’s Voice Enhancement solutions include noise reduction software solutions that have been tested in typical acoustic environment. These solutions can be modified to fit custom specification and they can be used in conjunction with speech-model-based solutions if required. Contact us to discuss your specific speech application requirements.